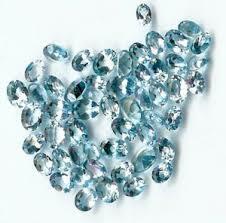 Aquamarine appears in various shades of blue. It goes well for tender skin and can be worn with considerable success for girls in the age group of 15-18. It is also a recommended stone for devout Hindus and others who may be inclined towards humanitarin and spiritual aspects of life and want to probe deeper into the mysteries of nature. It is a member of the Beryl family of stones as Emerald. Meaning - "sea water" it not hard to figure out that it derives this name due to its colour being similar to that of the ocean. The colour ranges from very light to medium light blue, frequently with a light touch of green. The most desired colour is the deeper shade of blue. It is often heated to enhance the colouration; this treatment is stable and permanent. It is very durable and well suited for jewelry. 1. It is said to have a soothing inlluence on married couples. 2. Its power to help husbands and wives work out their differences and ensure a long and happy marriage makes it a good anniversary gift. 3. It also protects against the wiles of the devil. Its dream means that you will meet new friends. It has become symbolic of safety at sea, and according to legend is a treasure of the mermaids. The first documented use of this stone is by the Greeks between 480 and 300 B.C. Its Amulets were thought to render sailors fearless and protect them from adversaries as sea, especially if the stone was engraved with Poseidon on a chariot. Who can wear Aquamarine as per astrology ? It is an ideal gem for those born on 3rd, 12th, 21st or 30th of a month (birth number 3) or for Pisces or for those in whose cases Jupiter is well placed in the ascendant in their natal charts. It is also a recommended stone for Leo. It should be worn by those who are interested in outing or entertainments or those involved in public relations jobs. It would also reduce tensions stresses in personal relationships, strenghten emotional ties and can protect the wearers in cases where others may exploits or play on their kind heartedness or generosity. It is highly recommended for those engaged in teaching and research, banking , medicine, humanitarin causes, travel and tourism, film industry, sailors and navigators and those interested to benefit from overseas connections. It signifies courage and determination and bestows investigative powers as welll as marital happiness. It is best for those who have ego problems and cannnot control their temper.